A refreshing book! So many ladies’ books dwell too much on our need to feel good about our position in Christ, but they let us off the hook when it comes to personal holiness in a sinful world. Not so here. 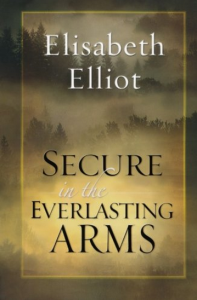 Elisabeth Elliot is known most widely for her marriage to martyred missionary, Jim Elliot. I find in her many books that Elisabeth Elliot continually brings my thoughts back to God’s sovereignty and how my life must always glorify God. Even when life seemingly doesn’t make sense, God is in control and knows best. This book is relevant for ladies in every walk of life from young girls, to single adults, to those married, with or without children, to those widowed. The only negative here is that Elliot regularly harkens back to her roots with Wheaton College and other Evangelical ties, institutions and associations which have since gone the way of New Evangelicalism and not Baptist Fundamentalism. Her themes of contentment, joy, service, and righteousness are easy to recognize with a slow reading. I read it too fast the first time!